Thoughts from a Traveling Tech: Back to school with you! So Mrs. T and I were wandering through our favorite grocery store the other day and I noticed something that just made me laugh. It was so rediculous that is absolutely had to go on the site. Last time I looked mangos were a lot more orange and a lot less red. This, my friend, is what happens when you put teenagers in charge and don't followup. Either that or the produce stocker is color blind, and a little lacking on the sense of touch. 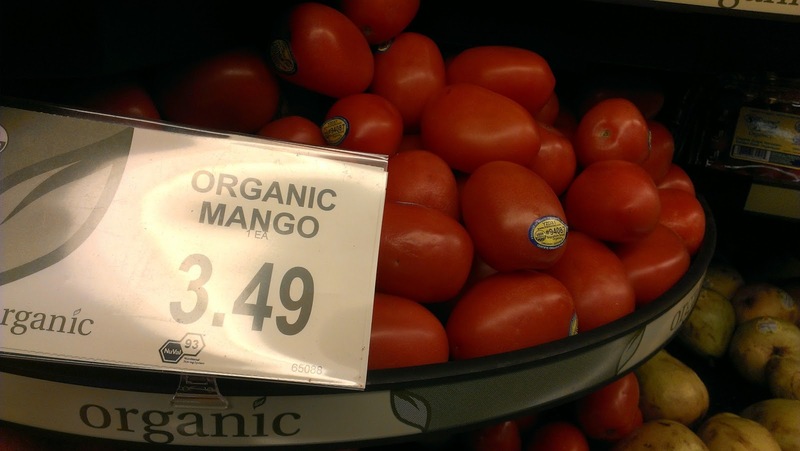 Tomatoes do NOT feel or look like mangos. At least none that I have ever seen. Mrs. T informed me that the really don't taste much alike either. Have to take her word on that since I am not a fruit eater. Then again, they are organic mangos, and they may be different that the non-organic ones.